Isabella Study 01 (Women with Necklace) 2014. Speaking at a Machine, 2013. Maisie Broadhead re-interprets art historical images, and is concerned with the exploration of illusion and the idea of ‘value.’ Broadhead’s exceptional eye for detail, quality and composition is conveyed through the making of complex set design, lavish costume, and theatrical direction to arrive at a final image. The viewer’s eye indulges in Broadhead’s re-presentation of rich, sumptuous fabrics, often with humorous contemporary embellishment. By using contemporary and historical elements, the images link the past and present by identifying enduring social and aesthetic narratives. Since graduating from her Masters in Jewellery at the Royal College of Art in 2009, Maisie Broadhead’s work has been critically noted by the British Press and has been exhibited in major museum shows such as Unexpected Pleasures: The Art and Design of Contemporary Jewellery, which was held at the National Gallery of Victoria, Australia in 2012 and which toured to the Design Museum, London (5 December 2012 – 3 March 2013), and the National Gallery’s first major photography exhibition, Seduced by Art: Photography Past and Present which explored early photography from the mid-19th century and exciting contemporary photographs, alongside historical painting (October 2012 – January 2013, at CaixaForum Barcelona, February 2013 – May 2013, and CaixaForum Madrid, June 2013 – September 2013). The artist’s critical success continued into summer 2013, winning an award at the Jerwood Makers Open, which recognizes rising stars in the applied arts. Most recently, Maisie Broadhead received a £20,000 grant from the Arts Council England for a public commission at the Brighton Pavilion (November 2014 – March 2015). 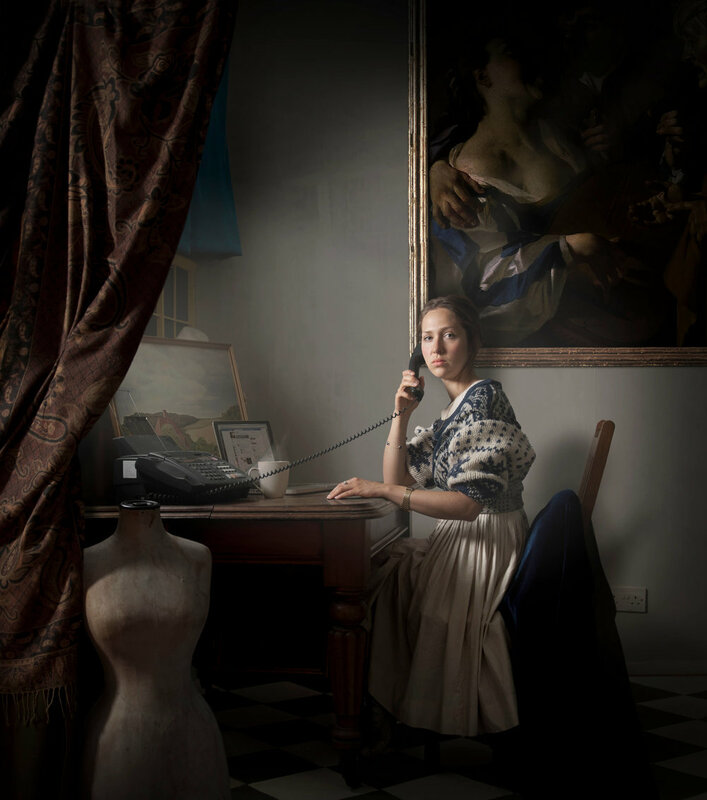 The latest series of mixed media photographs by awarded young British artist explores seventeenth century female portraiture while considering the role of women in contemporary society. Sarah Myerscough is pleased to present ‘Pearls’, Maisie Broadhead’s third solo exhibition organised by the gallery. On this occasion, the young British artist will present her latest series of photographic and sculptural works alongside a new video piece. This collection of new works includes a series of photographs entitled Broadhead’s Women; a collection of studies portraying three generations of women from the artist’s immediate family. 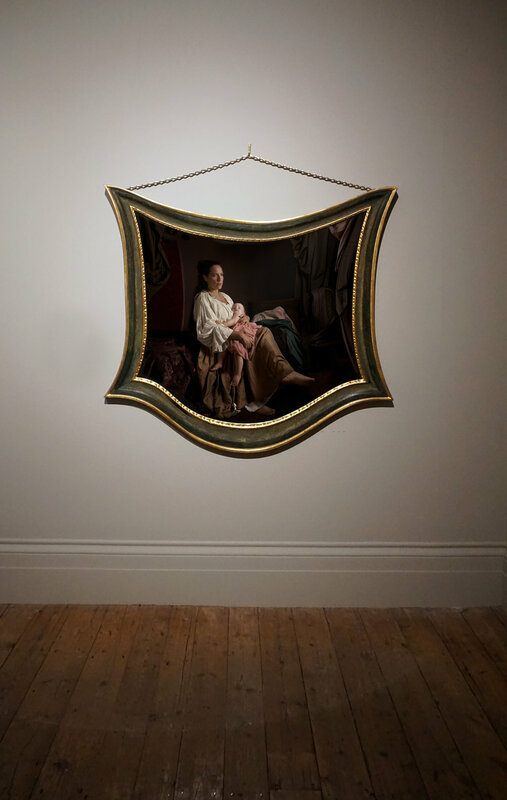 Broadhead’s Women reinterprets the recognisable compositional styles of two historical painters – Johannes Vermeer and Vilhelm Hammershøi – and highlights their similar obsession of repeating the narrative of women situated within quiet domestic interiors. By using the visual format of these iconic artists, while making subtle changes, Broadhead offers intimate and timeless portraits of femininity.